An activity we’ve come to really enjoy during our travels is taking a cooking class. It gives us a chance to learn more about the local culture through the food, gives us an opportunity to have authentic conversations with a local, and we also learn how to incorporate new flavor profiles our own kitchen back home. This also gives us a chance to “travel back” to destinations by cooking these dishes when our wanderlust kicks in and we’re not able to fly half way across the world at the time! Our Air BnB hosts at bARACA in Kampot suggested taking a cooking class with Khmer Roots and helped us call to book it. The class is held on a rural farm about an hour outside of Kampot. We were picked up by the owner and chef, Soklim, from our Air Bnb in Kampot on a tuk-tuk. The drive from Kampot to the farm was really interesting as we really got to see up close how the locals live in the rural areas. There were plenty of livestock just hanging out in people’s yards and beautiful rice paddies in between. Most of the homes there are built high up off the ground, as we later learned, during heavy rainy season, the areas flood several feet (or meters) high. After about an hour, we arrived at the farm. Luckily, we read beforehand that wearing tennis shoes is advised against, due to the muddy and wet terrain. Sure enough, we had to cross this little rickety bridge, and through a muddy trench – that, just as we were about to cross through, a dog decided to take a dump in…lol. Pooping doggie just had to go as we were passing through! We were led to the Khmer Roots Cafe that is part of the farm. Because it is in such a remote location, be sure to have your hostel or hosts call ahead to let them know you are coming if you want to try out their restaurant or cooking class. We were welcomed by Soklim’s wife, Joanna, who is originally from England. She gave us a little background of the restaurant, farm, and bungalows available for guests to stay on the farm. There’s even a small river that you can take a swim in. The farm itself is an eco-friendly farm pretty much off the grid, where they grow organic herbs, fruits, and vegetables. There are also some other animals like dogs, chickens, and kittens living on their farm. We were given the option of what to make and we went with things a little more unique and different to what we’ve ever made back at home. Minh went with the Red Massaman Curry, and I went with the Banana Flower Salad. After picking out the dishes we would each make, Joanna took us around the farm to pick out the ingredients and herbs we would use in our dishes. Banana Flowers are super young (and tiny) banana bushels! After collecting our ingredients, Soklim came in to instruct and teach us what to do for each dish. He gave us simple and easy to follow instructions on how to and what size to cut each ingredient. This was our first time making such a complex dish from scratch. Everything from the curry paste to the coconut milk was hand made. While cooking, we got a chance to chat with Soklim and learned that he learned to cook from his mother, who learned from hers. It’s pretty cool to know that these are generational recipes made from scratch that will continue to be passed down. Soklim also used to work in the hotel industry in Thailand, which is how he learned to speak English so well (and I think is where he met his wife, Joanna). Our food was finally ready to eat! It was a labor of love to make our lunch, and it was even more delicious knowing that we made it all from scratch. As part of the cooking class, you’re given time to explore the area or take a dip in the river. Since we just ate, and the water looked pretty low and muddy, we decided against swimming in the river. Instead, I went to go search for the kitties, and saw that one of them was eating a small dish of rice porridge (jook in Cantonese). I thought that was the cutest thing – it’s an Asian cat eating Asian food! Small things like that are what make you notice things you never even question or take for granted back home. It’s definitely a first-world norm or luxury to buy and feed your pets their own separate food. Shortly after, it started pouring rain out of nowhere. Since we couldn’t really go anywhere, it gave us time to play with the kittens – which we obviously didn’t mind! After about 25-30 minutes, the rain let up, and Joanna offered to show us the neighboring farms and homes. She had some friends and family visiting from back home and we all explored together. We walked out to beautiful rice paddies and met some of the neighbors who also care for some wildlife like pigs and chickens. One of the neighborhood boys climbed up one of the trees and picked some Guava for us to eat too. It was super sweet and delicious! The cooking class itself was very informative and we learned a lot about South East Asian cuisine. It really showed us that making things from scratch isn’t as hard as we previously believed. It also made us realize how much pre-packaged and processed foods we used to rely on when cooking before our RTW trip. While it is a little more difficult to find many of the fresh ingredients to make these curries from scratch back home, we’ve incorporated more fresh ingredients and from-scratch dishes into our home cooking. This was one of our favorite cooking classes we took during our travels. Maybe because it was just the two of us taking the cooking class that day, that it felt very intimate and we got a chance to chat with Soklim, Joanna, and meet the neighbors. It was as if someone welcomed us into their home (which, it actually is), and showed us how to make some family recipes. 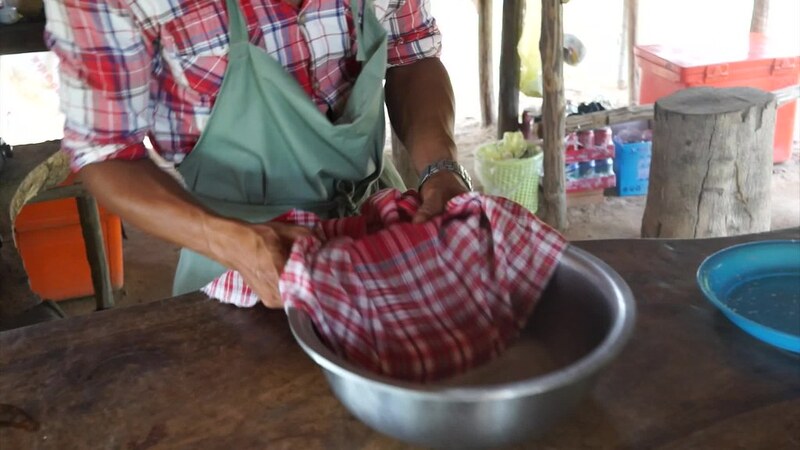 Besides learning to make these delicious dishes, we got a better understanding of local Cambodian farm life. At $20/person that included pick-up & drop-off from Kampot, and an e-mailed .pdf of the recipes, this class was definitely worth it. If you’re ever in Kampot, we highly recommend taking this cooking class!